The other wonderful thing about the beginning of cool weather is that it slows everything down. Just like in Spike Lee’s Do The Right Thing (go rent it if you haven’t seen it), when things heat up, the energy rages. Summer seems to be all about external experiences: Lots of beer drinking outside with friends, beach vacations and floating down the river. I feel like I spend much of summer running around trying to fit in every warm-weather activity that I can. Whenever the weather is perfect and warm I feel some pressure to make sure that I make the most of that time. But when the leaves start to turn my priorities turn more inward. Fall means that my favorite food-tastic holiday is on it’s way and that that uber-festive green and red one is on our heels, too. All of this coziness makes me think more about home and family. I find myself doing insane things like perusing cookbooks and recipe planning. I am also daydreaming about buying adorable holiday outfits for my niece. Essentially, Fall is when I prepare for my life as an elderly woman. 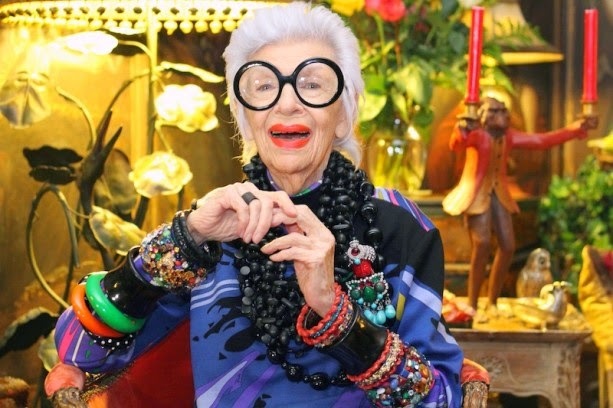 An elderly lady who piles on the makeup and jewelry like my idol: Iris Apfel. Speaking of which, I may be Iris for Halloween! We shall see! Next Post Finally home on Friday!